Printed from http://www.bodytalksystem.com//learn/news/article.cfm?id=862 on Apr 22, 2019. What makes us tick? Beyond Watson and Crick. 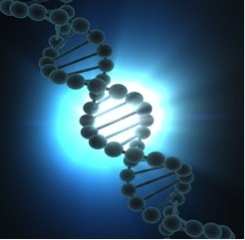 The idea has been that if we just know all about our genes then we know all there is to know about what makes us human. According to this thinking, genes are in total control of our health and disease and therefore curing disease is just a case of fixing a faulty gene. This has led to our regular headlines announcing scientific discoveries such as the gene for cancer or for Alzheimer's etc. It has also led to a race to crack the code of our DNA and find out what each of our genes actually do: the human genome project which was completed three years ago. However it came up with some rather unexpected results which have forced us to change our ideas of how our cells behave. These results were a little embarrassing and have been kept fairly quiet until now. You see, before the human genome had been sequenced, the genome of several other organisms such as fruit flies and mice had already been sequenced. Researchers expected the human genome to contain around 120,000 genes by extrapolating from these results. Humans display much more complex behaviour than fruit flies in general, so if we follow the idea that we are controlled by our genes and a fruit fly has 14,000 we should have many times more than this. What was actually found was that humans only have about 34,000 genes. This is much less than expected. We only have five times as many genes as bacteria and about the same as mice. Three years on from mapping the human genome and the scientific community are starting to really face the issue. New Scientist in February 2004 admitted that whatever it is that make us human it is not our genes. But enough of the confusion of mainstream science! 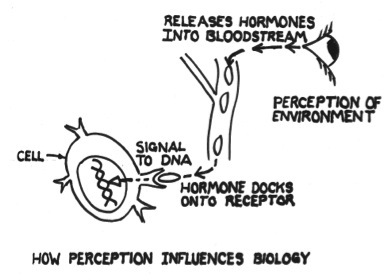 Anyone with sufficient experience of healing and working with charged emotional belief systems can have little doubt that the regulation of human biology lies external to the DNA: they will have witnessed the effects first hand of how resolution of aura blocks, emotional issues and limiting mental patterns can have a dramatic effect on physical health. From these observations it may be concluded that by resolving limiting patterns in the aura, emotional, mental bodies, we can design healing that will have an effect on the cell and even change the way that DNA is expressed. biology, demonstrating the significance of emotions on health. Part two looks at principles behind quantum theory and cosmology and how linking new physics with biology can give us new insights on why healing works. DNA is also a key factor in cell division: a process that appears to get out of control in cancer. So what is it that really regulates DNA? Dr. Bruce Lipton has been a pioneering voice in the field of molecular biology. For some years he has been arguing against the genetic determinism dogma that mainstream science has only just started to wake up to. Instead he demonstrates that the control of the cell comes from signals from the membrane of the cell. Proteins embedded in the cell membrane can 'see' outside the cell and pick up messages in the form of chemicals in the bloodstream which then cause a reaction in the membrane protein that ultimately ends in sending signals to the DNA in the nucleus. Those of us who have studied molecular biology will see that this is not so different from what is already taught, however the emphasis is on the control of the DNA coming from outside the cell rather than the DNA being the source of control. Lipton goes further: how are the chemical messages available to the cell in the bloodstream regulated? They are released as a response to the external environment of the organism. So if you have a belief (conscious or unconscious) that mice are dangerous, and you see a mouse, you will have a fearful response and release corresponding chemicals into your bloodstream which can then be picked up by your cells and translated into an appropriate response from the cell and your DNA. What happens if you do not have a belief that mice are dangerous? Herein lies the key to understanding the role that beliefs and emotional health has on physical health. The response to the mouse is based on the person's underlying emotional make-up and beliefs from all previous experiences of life. It is the underlying emotional and belief system make-up of that person that determines the perception and judgements of the environment such as whether or not a mouse is frightening. In this way Lipton demonstrates that perception is the control of the cell. Perception is the key to determining the translation of our DNA. Perception is based on our beliefs and emotional make-up. Clear the beliefs and emotional issues and the same stimulus in the environment no longer has the same response. of mind-body medicine making it very difficult to refute the idea that perceptions can trigger emotional responses resulting in an alteration of biology. According to the New Medicine when a person has a shock or a conflict that is sudden or severe – such as hearing about the loss of a loved one, they will have a corresponding response in an organ and in a corresponding area of the brain. Shocks that are to do with basic survival such as loss of territory (translated in modern living as conflicts with your boss etc) will cause a reaction in the more primitive areas of the brain such as the hindbrain. The shock results in a ring shaped focus of tissue damage which can be seen on CT scan of the brain. This focus will appear in a specific area according to the type of shock perceived and will have a corresponding reaction in an organ related to this area of the brain embryologically. The organ could react by producing more of a type of cell: possibly leading to what we know as the disease of cancer. Hamer has studied so many CT scans of people following a shock/conflict that he can now pinpoint where in the body is likely to be affected and what type of conflict it was. Hamer also realised that far from diseases such as cancer being meaningless mistakes by the body, they are actually the body's way of restoring equilibrium. For example if a woman has had a conflict of separation with her child, the tissue affected may be the left breast glandular tissue. It is as if the body wants to make the best of the time left with the child and produce more milk. The area of the brain that corresponds with breast glandular tissue is the cerebellum – an older part of the brain which may show the focus of damage on CT imaging. In the case of breast glandular tissue, when the beliefs systems about subject and emotional conflict is resolved the tissue goes back to normal. This pattern does not necessarily occur with all shock/conflicts so it is important to understand the natural progression of each type. Again with Hamer's work we see that it is the individual's perception of the shock that is important; if the woman views her relationship partner as if (s)he is like her child, a shock to do with her partner can produce the same patterns as conflicts to do with children. It is therefore important to understand the intricacies of the emotional shock for each individual. The findings of New Medicine are demonstrating the importance of healing emotional traumas on health. And from a BodyTalk perspective we can go deeper to resolve the inner conflict caused by pathological limiting beliefs and conditioning. In BodyTalk we can resolve the mental, emotional and physical conflict by investigating, in a priority based way guided and designed by innate wisdom. If the concept of consciousness comes first is true, then this "top –down" kind of inquiry and resolution takes us even deeper into the roots of the dysfunctional beliefs and conditioning that are a result of the experiences we have attracted in life and the learned reactions we develop as we try to cope. Join Dr. Manjir Samanta-Laughton for an intimate three day workshop. There are only 20 spots available, so reserve yours today! Namaste Nova is please to be hosting Dr. Manjir Samanta-Laughton for an intimate 3 day workshop in September 2014. Dr Manjir Samanta-Laughton is an award-winning international speaker and author, with two best-selling books translated into several languages. She is a former medical GP, bio-energy therapist and holistic doctor at the Bristol Cancer Help Centre and has now become a leading light in the field of linking cutting edge science and spirituality. In October 2013 Dr. Samanta-Laughton was the key note speaker at the International BodyTalk Members Conference. Her cutting edge science can be seen as fundamental to the BodyTalk System.